There are 3 types of fatty acids. EPA, DHA, and ALA (those are all acronyms). These are all called essential fats, meaning our bodies can’t make them, so we need to get them from the diet. So where do you get them from? EPA and DHA both come from fish and fish oil. You can get just DHA from algae (for vegetarians). Omega-3 fats are important for most key functions in the body. The fat in brain is 97% DHA. So it is important for mental function. They’re also good for maintaining cognitive function as we age. There’s also research showing its importance in helping with fighting inflammation, lowering blood pressure and more. Eating fish (particularly fatty fish) at least two times (two servings) a week. Each serving is 3.5 ounce cooked, or about ¾ cup of flaked fish. Fatty fish like salmon, mackerel, herring, lake trout, sardines and albacore tuna are high in omega-3 fatty acids. Be smart about eating fish as some may have mercury and other contaminants. A good rule of thumb, the bigger the fish, the more likely they are to be contaminated. Children and pregnant woman are advised to avoid eating fish with the potential for high mercury levels – shark, swordfish, king mackerel, and tilefish – but eat up to 12 oz of a variety of fish and shellfish lower in mercury (canned light tuna, wild salmon, Pollock, catfish). Middle-aged men and postmenapausal women – the benefits of eating fish far outweigh the risks when eating within the FDA recommendations. Should you take a fish oil supplement? For healthy adults with no history of heart disease: eat fish at least 2 times per week. For adults with coronary heart disease: In addition to eating fish 2 times per week, take an omega-3 fatty acid supplement (as fish oils) — 1 gram daily of EPA and DHA – daily. For adults with high cholesterol levels: Add an omega-3 fatty acid supplement (as fish oils), 2 – 4 grams daily of EPA and DHA. When it says 1 gram or more of EPA & DHA that is different than 1 gram total omega-3 fats. Looking at the side of your bottle of fish oil, add up how much EPA and how much DHA are in the product and those 2 numbers should add up to 1+ grams. It is always best to talk to your doctor before taking additional supplements. Also keep in mind you should aim to replace the bad fats in your life with these good fats. What is the best brand? 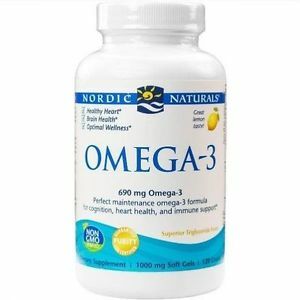 Nordic Naturals brand seems to be one of the best because it’s trusted when it comes to purity, quality, meeting label claims, its concentration, and freshness.